August 19, 2018 .Reading time 11 minutes. July 4, 2018 .Reading time 9 minutes. June 10, 2018 .Reading time 10 minutes. March 9, 2018 .Reading time 11 minutes. January 23, 2018 .Reading time 11 minutes. January 11, 2018 .Reading time 16 minutes. 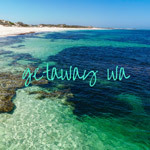 Getaway WA is a Perth-based blog by freelance writer Jo Rogers about travel and camping in Western Australia. Follow my adventures for camping tips, campsite reviews and info on well-known and more out of the way places to visit in WA.